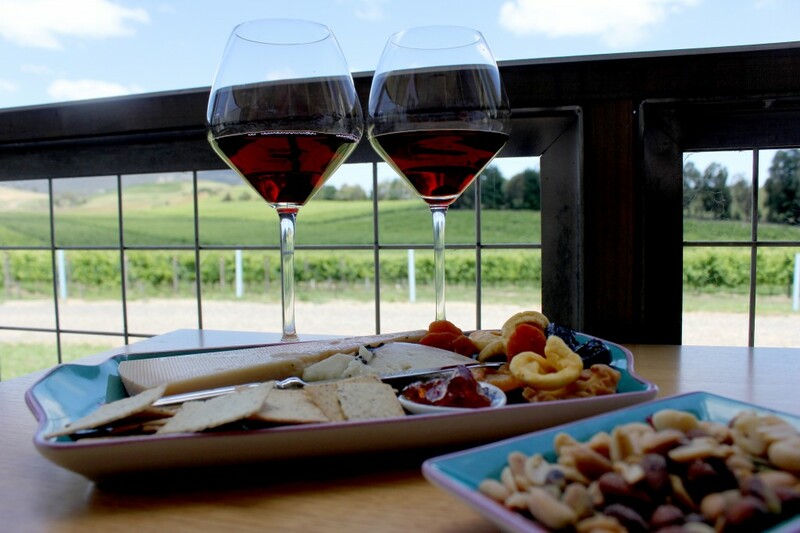 Discovering the magic of the Yarra Valley was a big highlight of 2013. After an incredible all-day wine tour with Vinetrekker in February, Mat and I found ourselves drawn back time and time again. It’s easy to forget just how close it is – but from Parkville it’s often less than an hour’s drive before the sprawling green vineyards make the big city feel a world away. 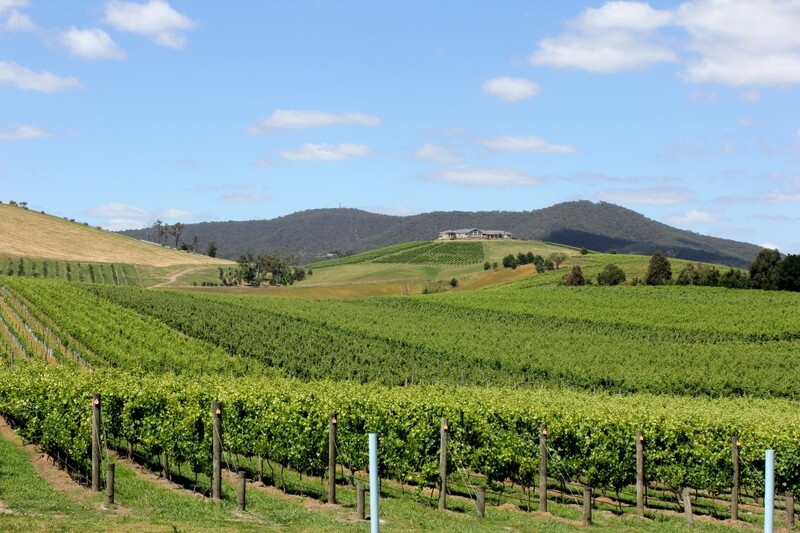 We recently took the opportunity to spend some time in the Yarra Valley over the New Year period to relax and see in 2014 with our good friends, Food and Wine. A visit to the Soumah cellar door was recommended to us by Ozzie, one half of a delightful duo that helm Tuck Inn – a gorgeous bed and breakfast in Healesville of which I cannot speak highly enough. Ever eager to make their guests’ stay in Healesville an enjoyable one, Donia and Ozzie are a wealth of knowledge on the area and love to give recommendations and advice on how best to make use of any time in the Yarra Valley. Small and no-fuss, Soumah sounded like the perfect place to begin a lazy day amongst the vines. Soumah is located less than ten minutes’ drive from Healesville in the town area of Gruyere. 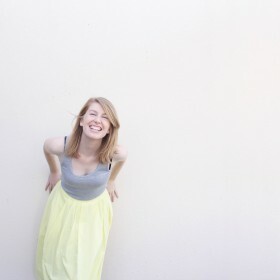 We arrived just before midday and will freely admit to the excitement of finding the place to ourselves! 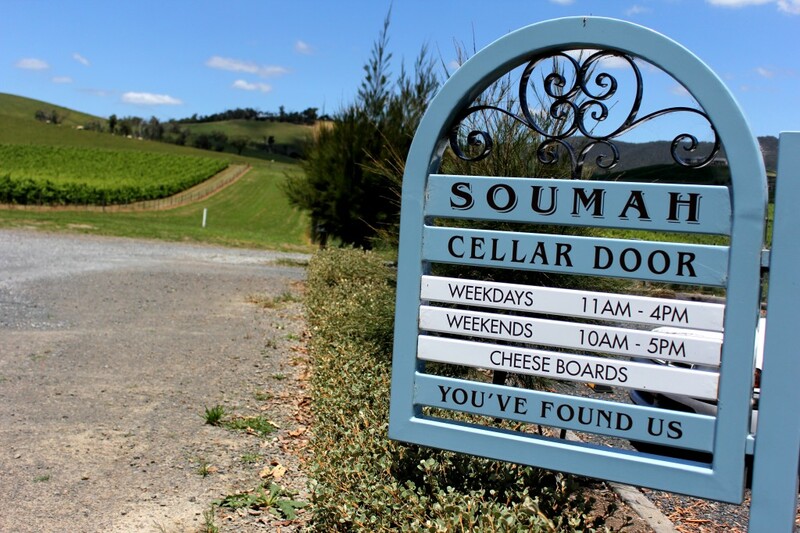 The Soumah brand was launched in 2010, and takes on the cool climate of the Yarra Valley with a Northern Italian varietal twist. The winery’s pride at the moment seems to be the award-winning ‘Savarro’ – a white wine made from Savagnin grapes with an interesting story behind its name. As the lovely lady taking us through our wine tasting told, apparently Australian grape farmers and winemakers mistook the Savagnin Blanc grape as another variety, the Albarino, for years! Only recently has it come to light that most ‘Albarino’ vineyards are in fact Savagnin Blanc. The Savarro name gives a nod to both varieties. To be honest I’d not heard of or tasted either – but the 2012 Savarro we tried was a really pleasant change from some other Yarra Valley whites we’d tasted. We ended up buying a couple of bottles ($26 ea.) and some surprisingly delicious Chardonnay cleanskins ($15 ea.) as well. 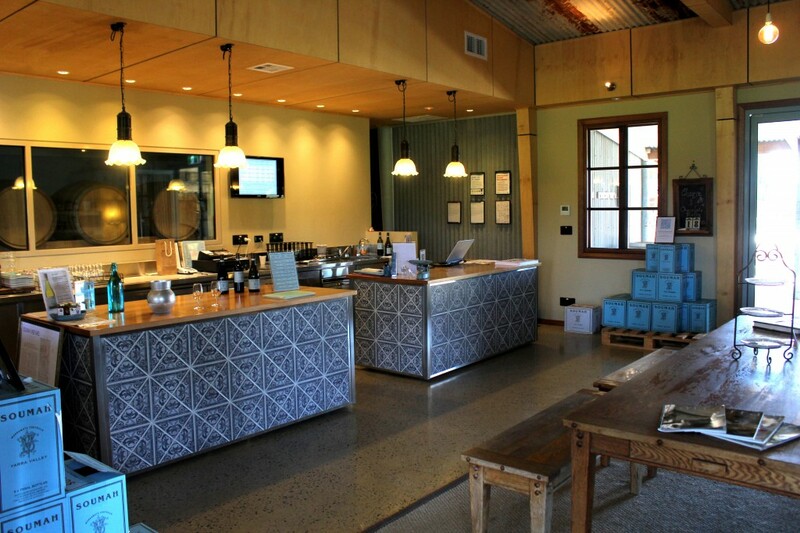 The cellar door tasting consisted of a generous eight or nine wines, and is free of charge for groups under six. As the only visitors at the time, we were really able to take our time tasting each wine and listen to the story behind each. In the end we picked a glass each of the 2012 Pinot Noir ($10 ea.) 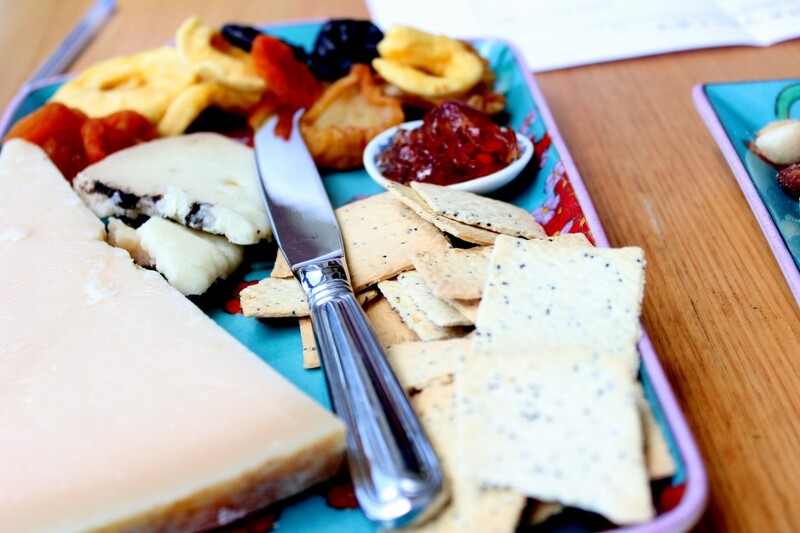 and set up on the outdoor seating area with an Italian cheese board of Black Truffle Pecorino, Buffalo Parmigiano, quince jelly, fruit, nuts and lavosh ($18). The vineyard view from the outdoor seating area was beautiful, and can definitely still be enjoyed in cooler months from the rear indoor seating area (there’s even a wonderful wood fire for winter visitors!). It certainly depends on what you’re looking for when choosing which wineries to visit in the Yarra Valley, but the quiet, relaxing atmosphere of Soumah is something we really loved. If that sounds like your style – or the Domaine Chandons and Yering Stations of the ‘Valley have simply got you a bit worn out – I’d definitely recommend a trip.